This story will make you go AWWWW. The Marvelous Wonderettes is looking MARVELOUS! The Marvelous Wonderettes moved from rehearsal room to stage over the weekend and my spies tell me that the show is fabulous! It’s chock full of great sounds from the ’50s and ’60s and the girls look (and act!) great in their costumes and wigs. Lighting, sound and set are all coming together – Wednesday’s opening should be a blast!! The Marvelous Wonderettes opens on Wednesday, September 28 and runs until October 16. For tickets, please call 860.767.7318 or book on-line. There will be a reception with the cast following the Friday, September 30 performance. Due to a family emergency, the auditions scheduled for Monday, September 26 have been postponed. Please keep checking this website for the re-arranged date and times. We apologize for any inconvenience. What a long week of rehearsing for our super senior prom debut. We were really beat and enjoyed a day off by shopping for patterns and material for our prom dresses. Missy has taken on the responsibility of making them for us in home economics class this week. However, we spent last evening helping her make our crinolines! Missy will be wearing blue to make her eyes shine for her secret love, Suzy will be wearing pink to match her favorite accessory, bubblegum, Cindy Lou is over the moon about wearing green to accentuate her auburn locks, and Betty Jean thinks it’s neato to wear yellow like a ray of sunshine! Watch out boys, because when these girls take the stage at prom, we’re gonna know your socks off! Insanity! We just received a phone call that the Croonin’ Crabcakes aren’t singing at the senior prom. We nearly flipped when they asked US to entertain. Here’s the skinny, we spent today cuttin the rug and learning brand new dance steps to our favorite songs at Missy’s pad. It was a gas today, when Betty Jean tripped showing us her latest version of the stroll and knocked over all of Missy’s vynls! What a goofball! More to come soon, but make sure you stay tuned and buy your tickets to the Super Senior prom because it is going to be MARVELOUS! Greetings all! Mr. Lee here. As many of you know I am heavily involved these days working with our own in school singing sensation the Wonderettes…pardon me- the MARVELOUS Wonderettes. Cindy Lou Huffington, Betty Jean Reynolds, Missy Miller and Suzy Simpson have been working very hard on their songs for their upcoming performance at the Marvelous Dreams Super Senior Prom. We’ve been meeting every day after school and working on some really terrific songs for you boys and girls. “Dream Lover”, “Mr. Sandman”, “Stupid Cupid”, and “Lucky Lips” remain some of their (our) favorites. We’ve learned our songs and now the girls (and I) are going to start working on some really swell dance steps for you as well. We will keep you posted as the magical night approaches. Take an unexpected blizzard, add a sprinkling of the Nutcracker, a pinch of Dickens’ Christmas Carol, stir in a little romance and festive song, top it all off with holiday magic and you get a new family tradition called Home for the Holidays premiering at the Ivoryton Playhouse. The Ivoryton Playhouse will be holding local auditions for the annual holiday show Home for the Holidays on Monday, September 26th from 4pm – 8pm at the Rehearsal Studio, 24 Main Street, Centerbrook, CT 06409. Roles are available for 12 adults and 4 children under age 12. One of the children should have some ballet experience. Auditions are by appointment and actors should bring a picture and resume and prepare a short monologue and a song. 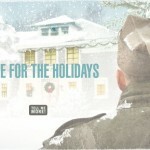 Home for the Holidays is a new play written and directed by Ivoryton Playhouse Executive/ Artistic Director Jacqueline Hubbard. Show runs from December 8th – 18th. Thank you to everyone who supported our raffle during the run of Ring of Fire! We raised a total of $5,890 during the four week run which exceeded our expectations! And those great folks at Pasta Vita have generously matched this entire amount so we are totally thrilled with the result. What’s Marvelous about the Wonderettes? Four beautiful, extremely talented women burst into our office yesterday ready to “rock and roll”!!! Rehearsals for The Marvelous Wonderettes have started and, under the direction of John DeNicola, it’s already sounding fabulous! The show is chock full of music from the ’50s and ’60s including: All I Have To Do Is Dream, I Only Want To Be With You, It’s In His Kiss, It’s My Party, Lollipop, Respect, Son of a Preacher Man and so many more top hits you’re sure to love! The Marvelous Wonderettes opens on September 28 and runs until October 16. Call the box office now to secure your seats – 860.767.7318 or purchase on line! Click here to see photos of the cast and read their bios.